If Windows 7 represents peak Windows for you, you’re not alone. Twice as many people use Win7 as use Win10, even after 18 months of Microsoft pressure to get you to give up Win7 and jump to the shiny new version as your operating system of choice. The key, as you might expect, is to stow away a solid “ground zero” full backup. From that point, you should patch judiciously, use incremental backups scrupulously, and tend to the maintenance jobs that you’ve no doubt neglected. If you go about it in an organized manner, your machine should last forever ... or at least until you throw it in the trash and buy a new one. Before you back up your machine, make sure it’s in top shape. Microsoft may use the computer information, accelerator information, search suggestions information, error reports, and Malware reports to improve our software and services. We may also share it with others, such as hardware and software vendors. They may use the information to improve how their products run with Microsoft software. The method for bringing your Win7 up to speed and keeping it going for the duration depends on how much information you’re willing to share with Microsoft about your system, software, and activities. Starting in October 2016, Microsoft changed the way it distributes patches to accommodate individuals and organizations that only want security updates, and not other patches that may affect how much information is collected and sent to Microsoft. That gave rise to two patching strategies and a “no patch for me, please” option. Group A: Those who are willing to take all of Microsoft’s new telemetry systems, along with potentially useful nonsecurity updates. Group B: Those who don’t want any more snooping than necessary and don’t care about improvements like daylight saving time zone changes, but do want to keep applying security patches. Group W: Those stalwarts who will take their chances and don’t want to install any new patches, whether they fix security holes or not. Group A (apply all of the offered patches) or Group W (don’t ever patch) are the easiest to join, but Group W is vulnerable to all sorts of problems. I don’t recommend Group W. Group A can use Windows Update to get everything they need. It’s harder to join Group B, because it requires manual download and installation of patches. It’s helpful to figure out whether you want to be in Group A or Group B (or Group W) before getting going. Right off the bat, you need to make sure your Win7 system is fit to fly. There's no sense preserving a baseline system in stone (or at least in backup) until the baseline is working right. For many of you, Windows 7 works fine the way it is. If that describes your situation, skip to Step 3. Obtaining “genuine” Windows 7 Service Pack 1 installation files can be difficult. Once you have Win7 SP1, which updates should you install? Obtaining the real ISOs is a significant concern because there are many pirate copies of Win7 floating around the internet. Until May 2014, you could download the retail bits from an Microsoft distributor known as Digital River. In an InfoWorld column, I talked about the way that source disappeared. From an authorized retailer. The product key should be on a label or card inside the box that Windows came in. A new PC running Windows. The product key will be preinstalled on your PC, included with the packaging the PC came in, or included on the Certificate of Authenticity (COA) attached to the PC. But I’ve heard from many people that the keys they’ve retrieved (typically from ProduKey or Belarc Advisor) don’t work, even keys from a 100% genuine Win7 installation. I’ve also heard that retail keys -- the ones inside a box that you bought with Win7 inside -- work in all cases. For customers who do not have a product key, they will need to contact Microsoft Customer Support Service, where we have alternative options for acquiring the Windows 7 product when they have lost their media. A clean install isn’t for the faint of heart. No matter how hard you try, you will lose data, somehow, somewhere -- it always happens, even to us masochists who have been running clean Windows installs for decades. Start with a full set of program installation CDs, DVDs, or a list of locations where you can download what you’ll need. Make sure you have all the keys. Stick all your passwords in a repository like LastPass or RoboForm. You should send your data, and settings wherever possible, off to DVDs or an external or network drive using a product like Windows Easy Transfer (see Lance Whitney’s how-to on the TechNet site). Then, armed with a good copy of Win7 SP1, you’re ready to follow Canadian Tech’s steps to install a clean copy of Win7. Note: I don’t recommend installing the so-called Convenience Update, KB 3125574, which was created to roll up many outstanding patches. Although the Service Pack 2-like update may save you some time, in my experience if you follow Canadian Tech’s advice, the speedup is minimal. The all-star team of Abbodii, PointZero, and Komm has documented the shortcomings of the Convenience Update, and they shouldn’t be overlooked. 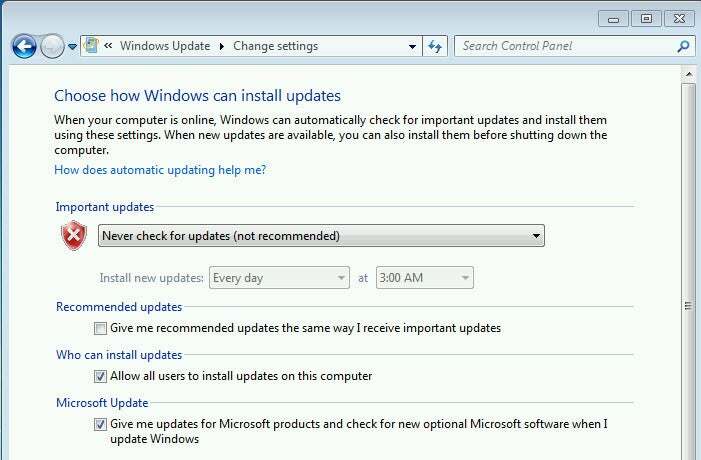 If you didn’t install a fresh copy of Windows 7 from scratch, you may have trouble with Windows Update taking forever. 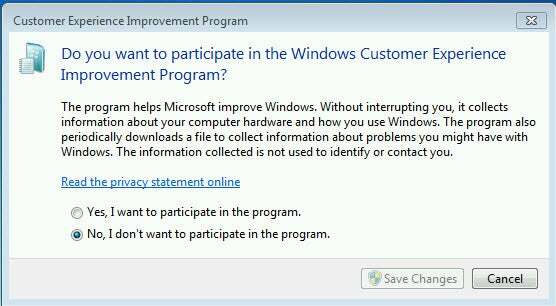 Start by following the two simple steps to eliminate unconscionably slow Windows 7 Update scans. Then selectively apply patches you need to get caught up. 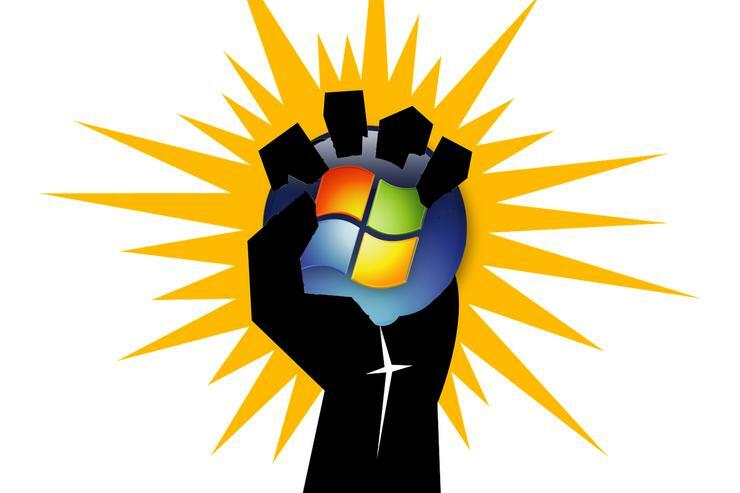 Starting in October (the “patchocalypse”), Windows 7 patches began arriving in two clumps: Security-only patches (for Group B), which you have to download and install manually; and Monthly Rollups (for Group A), which include nonsecurity patches and are available through Windows Update. Choose Group A or Group B, and bring your machine’s Windows up to date. Yes, if you’re in Group W, you can skip this step. When all seems correct, make one more run of Windows Update to make sure you have the latest patches for Office, .Net, and anything else that may need updating -- including non-Microsoft products. Turn off Automatic Updates. Click Start > Control Panel > System and Security. 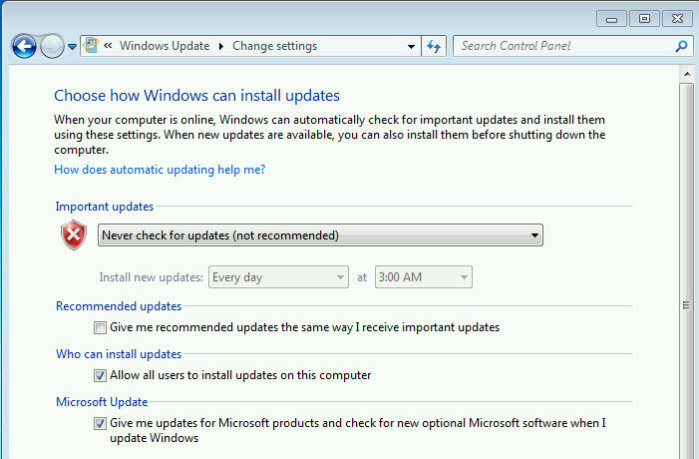 Under Windows Update, click the "Turn automatic updating on or off" link. In the Important Updates box, choose “Never check for updates (not recommended).” Uncheck the box marked "Give me recommended updates the same way I receive important updates" and click OK. Turn off the Customer Experience Improvement Program. Click Start. In the Search programs and files box type customer, then click on Change Customer Experience Improvement Program settings. 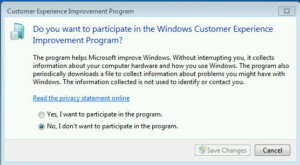 Click “No, I don’t want to participate in the program,” then Save Changes. Disable Tasks you don’t want. Go into the Task Scheduler by clicking Start and, in the Search program and files box type task. Click on Task Scheduler. You can find many recommendations on the web about which tasks to prune, but the best advice I’ve found comes from AskWoody’s ch100, who recommends disabling the Application Experience agent (AitAgent), Microsoft Compatibility Appraiser, and ProgramDataUpdaters, all three of which appear in the \Microsoft\Windows\Application Experience folder (screenshot). There are also scheduled tasks related to the Customer Experience Improvement Program (CEIP) that may or may not be disabled when you opt out of CEIP. If you’re very cautious, see this post from JY on AskWoody. Update your browser. If you insist on using Internet Explorer, make sure you have IE11 installed. If you aren’t locked into IE, try Google Chrome or Firefox. Jettison the junk. You’re going to create a top-quality copy of your hard drive. Why burden it with junkware? With its newly found 64-bit capabilities, I like the free version of Revo Uninstaller. Note: Those with detailed knowledge may want to dive deeper into hardening their systems. We have ongoing discussions -- and knock-down debates -- about the details on AskWoody.com. MVP Noel Carboni specializes in keeping Win7 systems locked down. One last step before you freeze your system like Han Solo. 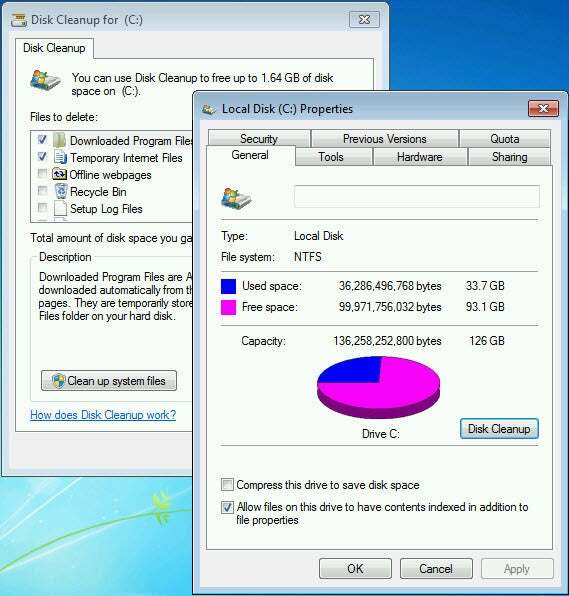 Run a disk cleanup. While there are many utilities that will help you zero in on duplicated files and ferret out grunge sitting in odd corners, Windows’ built-in Disk Cleanup will take a big swipe at the detritus. It has the added advantages of being both free and easy to use. To do so, click Start > Computer. Right-click your main drive and choose Properties (screenshot). Click Disk Cleanup. In the resulting Disk Cleanup dialog box, click “Clean up system files.” Follow the instructions and sweep out the old. When you’re done, if you have a spinning hard drive (as opposed to a solid-state drive), run a defrag: Click Start and in the box marked Search program and files box type defrag. Chose Disk defragmenter and click on the button to Defragment disk. You’re finally at the point where a full disk image backup makes sense. Yes, you should back up your data, too, as part of the system image. I recommend making a single backup at this point -- when your system’s working great -- and squirrel it away. Augment that with your usual backup regimen, if you have one. Before you start the backup, make sure you have your system usernames and passwords written down, for every user on the system. You’ll also sleep better if you write down your Windows activation ID. If you can’t find an activation ID on a sticker attached to your PC, run NirSoft’s ProduKey (screenshot) to pull it out of your machine. That key probably won’t get you a clean copy of the Windows 7 files, but it should be a good starting point for arguing with Win7 activation phone support, if you can’t get a restored image of Win7 activated. Yes, it happens. To get serious about creating and maintaining backups, install and run a dedicated backup/restore package. Two of the best: Macrium Reflect (free for personal use; $70 or less per PC for businesses) and Acronis True Image (free 30-day trial, then $50). Follow the installation instructions, create a full disk image on an external drive or networked drive (or on DVDs, if you must), then disconnect the drive and store it someplace safe. Make sure you store a system repair disk along with the main backup. After you’ve gone through the first round, set up Macrium Reflect or Acronis to generate a second full disk image, followed by incremental backups. If you really want to use the Win7 backup routines -- they are free and work reasonably well -- buy an external hard drive and plug it in. Click Start > Control Panel > System and Security > Backup and Restore. You see the “Back up or restore your files” dialog (screenshot). On the left, click “Create system image.” You may create the system image on a hard drive, DVDs, or a network location. To go out to the network and look for a suitable location, assuming you have one, click Select. 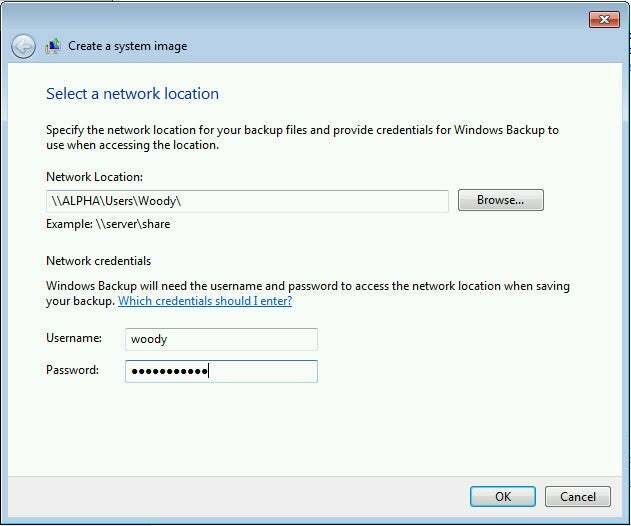 From the Create a system image dialog (screenshot), you can put your system backup on any accessible drive attached to your network. 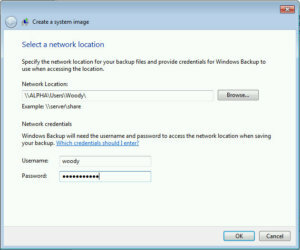 Once you’ve create a full system image you can tuck away, tell Windows Backup that you want to keep incremental backups. Back on the “Back up or restore your files” dialog, click “Set up backup,” follow the directions to choose a backup drive, select which data should be backed up, and when the backups should run (daily or monthly incremental backups). Depending on the size and speed of your drives, the first backup can take hours. Before you forget about backups forever, click the link on the left in the “Back up or restore your files” dialog to “Create a system repair disk.” Follow the instructions to create a bootable disk that you can use to recover your hard drive if everything heads south in a hurry. Microsoft has full instructions in Help article 17127. Periodically make sure your antimalware program is working. I use Microsoft Security Essentials (free), and it’s pretty noisy when it hasn’t been fed. Augment your antimalware program with weekly runs of Malwarebytes (free for personal use; $50 per PC for business), or some other second-opinion software. Check your backups at least once a month. Details vary depending on which product you use, but checking on the integrity of backups is as simple as using Windows Explorer to look at the files. Your hard drive is going to fail sooner or later -- accept it. Solid-state drives last longer than spinning platters, but they’re all doomed to failure at some point. It’s a good idea to check your drive every month or so, to make sure it’s working well enough. Run a defrag if you like (click Start and in the “Search programs and files” box type defrag). Also consider running a S.M.A.R.T. 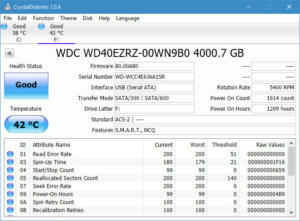 drive status detector like CrystalDiskInfo (open source). While S.M.A.R.T. technology won’t tell you if a drive’s about to die, it can help pinpoint recurring problems. If you’re in Group A or Group B, run Windows Update from time to time, but don’t be in a big hurry to install patches as soon as they’re available. We have ongoing notices in the Woody on Windows columns, tracking problems and letting you know when the coast looks clear. If something goes wrong with a peripheral, realize that replacing it is almost always cheaper than fixing it. Mouse doesn’t work? Try a different one. Keyboard on your laptop singing the blues? $20 will buy a new USB keyboard (or $100 will buy a great one). Need more drive space? External drives are amazingly cheap. Wi-Fi card doesn’t work? Get one that plugs into a USB port. DVD drive? Pshaw. If you need a new driver, don’t get it from Windows Update. Instead, go to the manufacturer’s site and install it manually. Don’t do anything stupid. If you see an announcement that your computer has 379 unpatched vulnerabilities or you need to install some whiz-bang software to keep your system clean and green, ignore it. Your most destructive Win7 weapon is your clicking finger. How to prepare for the Win7/8.1 "patchocalypse"